Thousands of Texans flocked to the steps of the Capitol building in Austin Tuesday for this year's Texas Muslim Capitol Day. Participants held hands and sang the country's national anthem to show their support for their Muslim compatriots amid President Donald Trump’s executive order banning citizens of seven Muslim nations from entering the U.S..
Texas Muslim Capital Day, which was created with the goal of teaching Muslims how the state government in Austin works, has been held every other year for more than a decade. But many of the people who attended this year’s event told local reporters they did so because they felt Trump’s 90-day bar of people from Syria, Iran, Sudan, Libya, Somalia, Yemen and Iran entering the U.S. was a direct attack on the Islamic religion. "I am here to protect my Muslim brothers and make sure that they have the same rights and liberties as every other American," Hart Viges, who served with the U.S. Army in Iraq, told Reuters. As Tuesday's crowd erupted into chants of “No bans. No Wall,” referencing Trump’s proposals to ban Muslims and build a wall on the U.S.-Mexico border, protestors shouted back praises for the president's executive orders that they believed were created for the safety of the country. Texans also showed their support for the Muslim community after the Islamic Center of Victoria, 125 miles south of Houston, was destroyed by a fire Saturday morning. A GoFrundMe page aimed at rebuilding the religious site received nearly a million dollars in donations by Wednesday afternoon. Texas authorities were still unsure about what started the blaze. 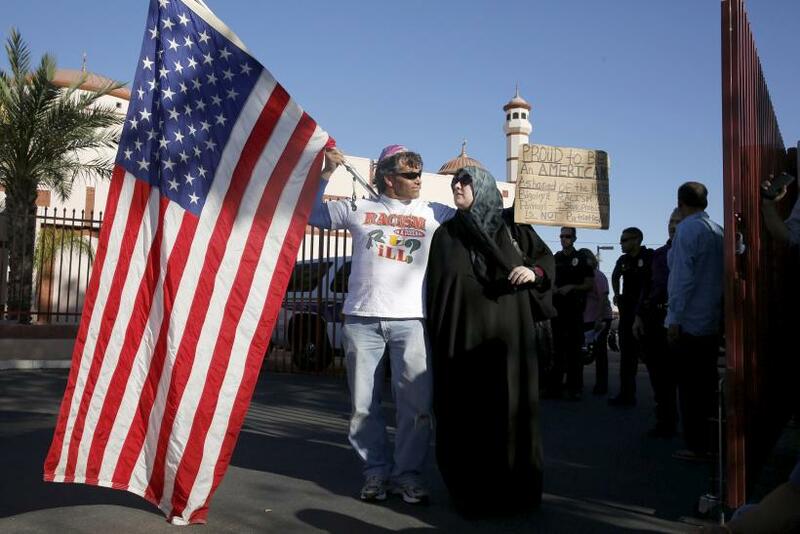 Hate crimes against Muslims across the U.S. increased by 67 percent in 2015, the Southern Poverty Law Center reported on Nov. 14. Of the 867 incidents of hate crimes reported across the country after the Nov. 8 election, 6 percent were directed toward Muslims, according to another Southern Poverty Law Center report from Nov. 29. Since Trump signed the executive order Friday, at least 109 people were detained at U.S. airports across the country and denied entry, the New York Times reported Monday. All those in detention were reportedly released Monday morning.